Pale green glassy faience (or glazed steatite?) 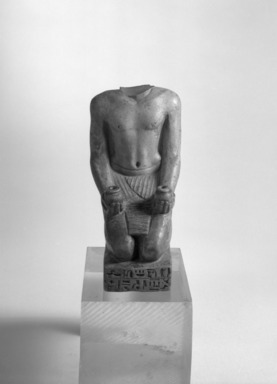 figure of Nes-ba-neb-djedit, "Prophet of Amun-Re," kneeling, holding two nw-pots and wearing a shendyt kilt. Back pillar and base inscribed. Head and top of back pillar missing.